It's quite hard to choose the photos from the first selected 100. There are a few problems that arise with the images. First of all, I took them with a camera that adds a lot of grain when shot with a high ISO. Therefor, I'm not pleased with the overall results of the photos. So I just have to accept that as a given and now focus on what it is that I really want to show. 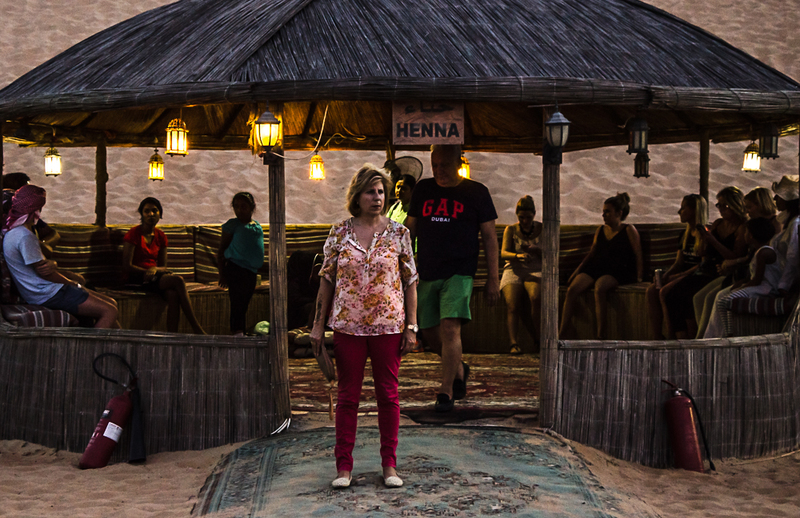 The most important thing is to see how the tourists respond to this exotic environment, how they experience these new cultural elements and are they true reflections of the Arab culture anyway, or simply stereotypes? The assignment gave the option to follow the same people doing different activities or different people at the same single activity or event. I choose to not follow one specific group of people, but to show all the elements of what the desert trip entails. I chose these as my final selection, because I think they all reflect the meetings of culture and interest in the culture in a strong way. The belly dancer was shaking her hips very skilfully and it was very funny to see how most people were looking at her through their ipads or cameras. I like how in the first photo all eyes are on the dancer and how the dancer is clearly interacting with her audience. In the second and third photo I want to show how the local drivers (who are mainly Indian actually) were looking at the performance from a distance. Form both images I'll select the third one, because it emphasises the space between them and the tourists and gives a good sense of the location itself. Because of the wide angle approach, there's a certain distance and objectiveness when looking at the photo. This is a nice contrast from the first one, which was taken with a longer focal length and therefor has a much more compressed feel. 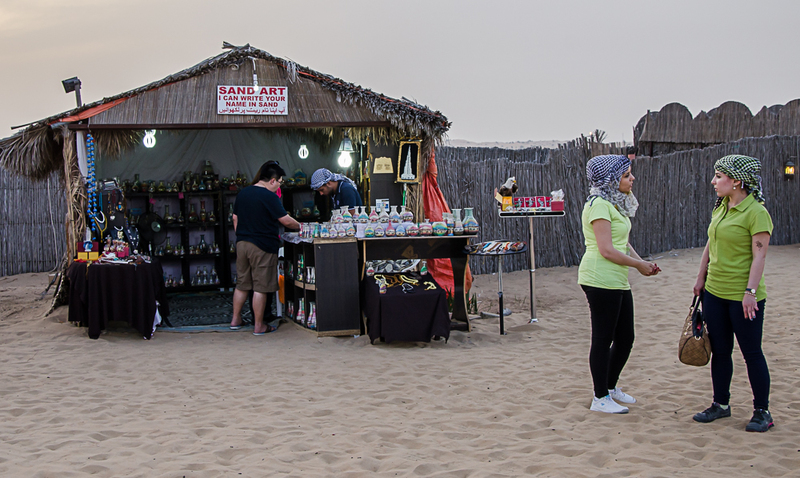 I have included the image from the buffet, because there's a line up of typical Arab souvenirs going in one direction and a line of tourists going in the other direction. The Asian guy and blond lady are in contrast with the souvenirs. the sign buffet gives a hint of why the people are waiting in line. 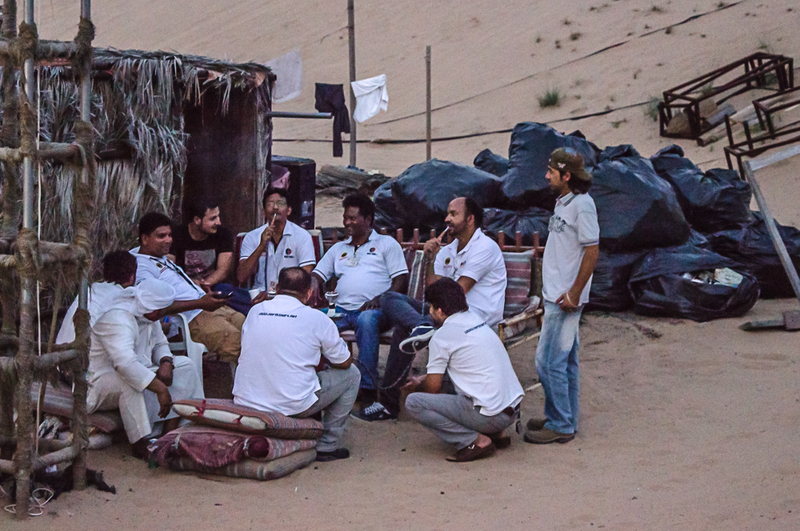 The second series are the images that show the 'locals' in other words, some Arabs and Indian tour guides, and how their behaviour shows some of the 'real' culture. Even though the quality of image of the tour guides together is really poor, I do want to add one of them, to show what's going on around the edges of the event. The garbage in the back and the men having a good conversation while smoking a water pipe shows more of reality than if they had been photographed with the tourists. I'll choose the second image, because the laundry is more visible in the back and I like the expressions more. Because the man in the front has kneeled down, all the subjects are visible, making the image a better composed and arranged whole. I'm doubting about the third image. His trousers and headscarf show that he's not a tourist and I like his pose. With the tourists in the back there's a nice contrast. Still, because it's not really obvious what the subject is looking at, I wonder if the narrative element is strong enough. It is the only image in which the vastness of the desert is shown, so I'll add it after all. 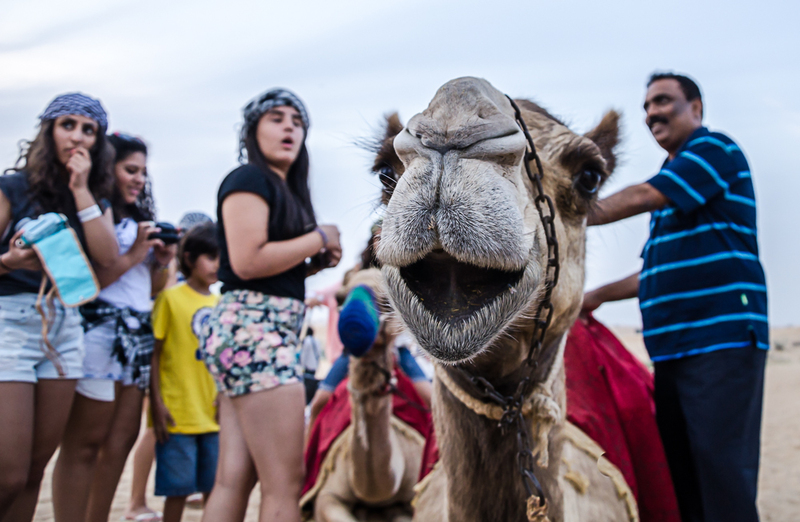 The image with the Arab in front and the tourists on camel appeal to me because it's a contrast again of the local and the tourists doing the 'local' thing, a similar theme of the image before. It's a pity that the man in the front is not in focus. So here I'll choose for the quality of the image and go for the third one. 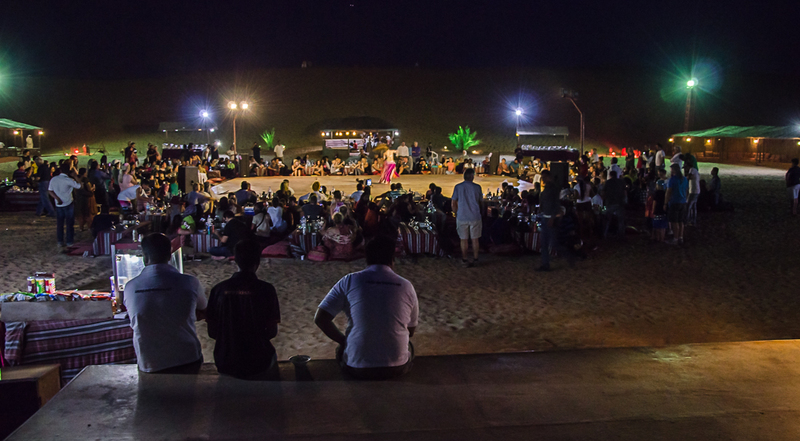 These images give a good sense of how the tourists were enjoying the 'Arab' culture. The third image is my favourite, mainly because of the lady sleeping on the mattresses, the disapproving look of the guy with the cigarette and tattoos and again somebody taking a picture in the right top corner. I took the first camera with a wide angle lens, which accentuates the distance between the people, even though they're standing very close to each other. The men on the left are deciding whether they should be sitting down on the pillows, while the woman in the middle is drifting off in her own thoughts. The Chinese man on the right is staring in his glass of wine. It's an image of how total strangers from very different places meet at an other strange, surreal place. This image is very grainy and I need to adjust it a bit, but I really like this image. The lady just got a henna set on her arm and is standing outside with a bewildered face. The fire flasks on the side and the word gap on the shirt of the man behind her all seem to work together. 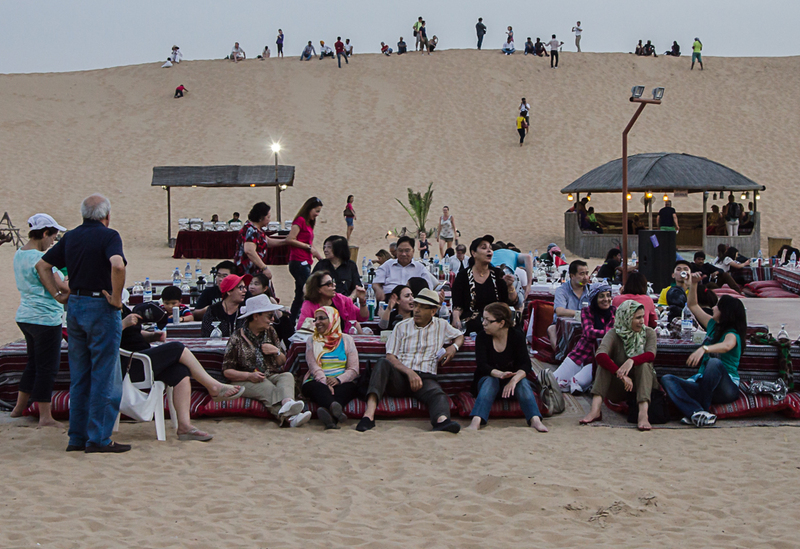 I want to select an image that shows how the tourists 'buy in' the cultural aspect of being in the desert. Of all three, I think the third one is the most interesting, also because of the 'I can write your name in sand' sign. The girls with the green shirts have done it all, bag in the hand, henna on the arm and both wearing a scarf that they had just bought there. I think of all three images, this one has the strongest narrative element. Now it's starting to be tricky, I actually like all the images with the camels. In the case of these 5 ones, i'll select number three and 5. Number three attracks me because of the girl's and camel's similar expression, the shorts the girls are wearing and how the man is grinning. I like image 5 because of the timing. You can see one camel just kneeling down and the little boy on the left being scared of going down as well. 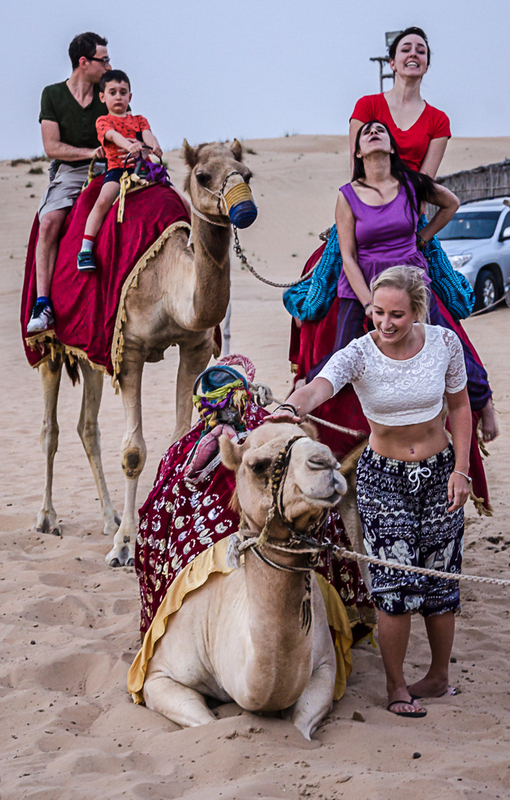 The girl with the short shirt seems a bit out of place, but she obviously loves camels. Even though I've got more than 10 images, I do want to include them. The first one shows a nice typical touristy interaction between the bird, man and woman. Instead of looking at the bird, or the trainer, she's looking into a camera, just to make sure to get the moment captured. I want to add the second image because it's a good reflection of how he camp is set up and how you can walk in and out of 'culture' , making sure to get it on camera. So these are the final images. Now I'm going to look back at them and retouch a bit more to have consistent colours and contrast throughout the images.